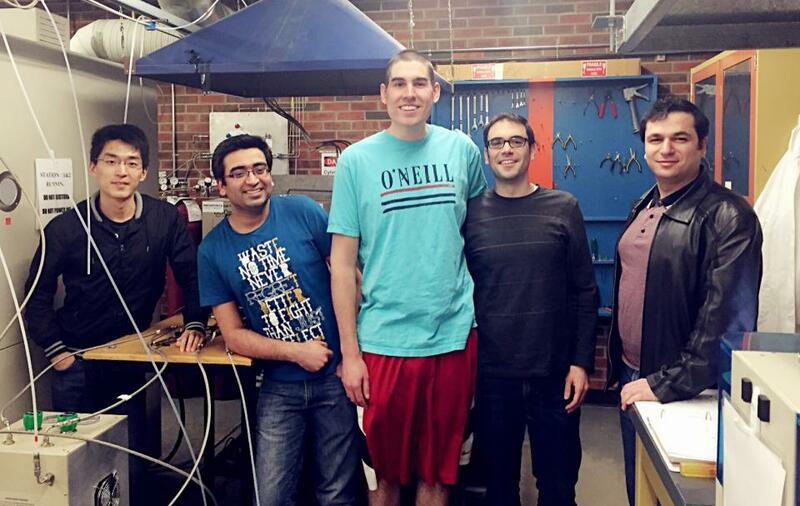 Developer team: M. Secanell, J. Zhou, A. Kosakian, M. Sabharwal, C. Balen. Dec. 11, 2016: Release 0.3 is out! Download the package in Github. Run a fuel cell right now! OpenFCST online simulation app is available. Improved documentation: Improved user guide and folder with input files for several of the articles above. Improved post-processing capabilities: New classes developed to be able to output oxide coverage, agglomerate effectiveness, relative humidity, overpotentials and more. Improved post-processing capabilities: New classes to compute functionals such as overall current density and all types of heat losses. The Fuel Cell Simulation Toolbox (OpenFCST) is an open-source mathematical modelling package for polymer electrolyte fuel cells. OpenFCST builds on top of the open-source finite element libraries deal.II, therefore many of its requirements in terms of operating systems and such are the same as for deal.II. OpenFCST is distributed under the MIT License. OpenFCST has been developed as a modular toolbox from which you can develop your own applications. It contains a database of physical phenomena equations, fuel cell layers and materials, and kinetics mathematical models. In addition, it already contains several applications that allow you to simulate different fuel cell components. For example, you can simulate a cathode electrode (using either a macrohomogeneous or an ionomer-filled agglomerate model), an anode electrode or a complete membrane electrode assembly. The applications already provided in OpenFCST have been validated with respect to experimental data in the literature as well as numerical results from another model implemented in a commercial package. OpenFCST is being developed at the Energy Systems Design Laboratory at the University of Alberta in collaboration with the Automotive Fuel Cell Cooperation Corp. that, together with the Natural Science and Engineering Research Council of Canada has provided the majority of the funding required to develope this code. The goal of OpenFCST is that research groups in academia and in industry use the current toolbox to better understand fuel cells and to develop new physics and material databases that can then be integrated in the current library. 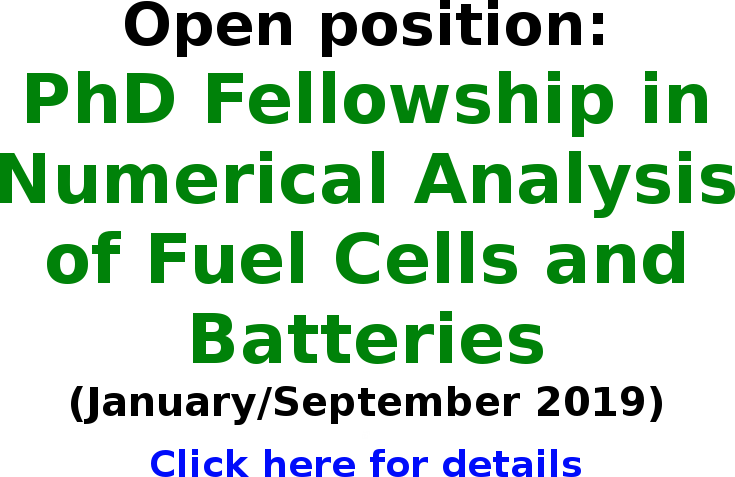 OpenFCST is an integrated open-source tool for fuel cell analysis and design. It has been developed primarly using the deal.II finite element libraries. It seamlessly integrates several open-source pre-processing, finite element and post-processing tools in order to analyze fuel cell systems. OpenFCST contains a build-in mesh generator as well as it can import quadrilateral meshes generated with the open-source pre-processor Salome if your problem requires to simulate more complex geometries. 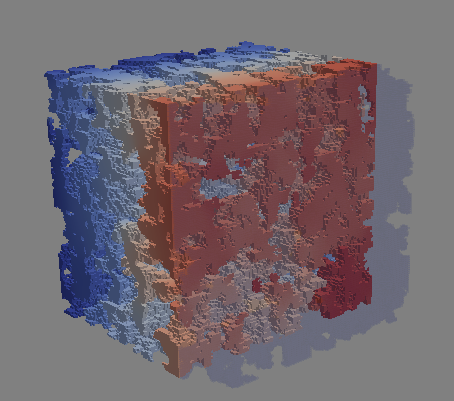 The physics and material database in OpenFCST allow you to setup the governing equations for the most important physical processes that take place in a fuel cell. OpenFCST already implements the weak form for many governing equations that are finally solved using the finite element open-source libraries deal.II. In order to analyze your results, OpenFCST can output your results to .vtk files that can easily be read with the open-source post-processor Paraview. OpenFCST is not only an analysis tool. OpenFCST also is also integrated with the design and optimization package Dakota. Therefore, it can be used for design and optimization as well as parameter estimation. M. Secanell, A. Putz, P. Wardlaw, V. Zingan, M. Bhaiya, M. Moore, J. Zhou, C. Balen and K. Domican, "OpenFCST: An Open-Source Mathematical Modelling Software for Polymer Electrolyte Fuel Cells", ECS Transactions 64(3): 655-680, 2014. doi:10.1149/06403.0655ecst. OpenFCST development team. 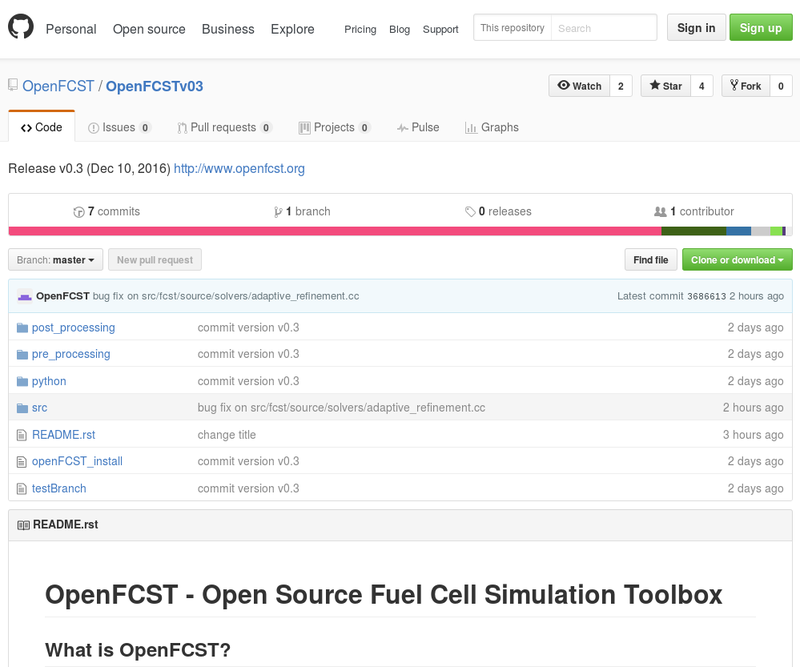 Fuel Cell Simulation Toolbox (OpenFCST): User and Developer's Reference Guide. OpenFCST version 0.3 is now available! Downloads page.